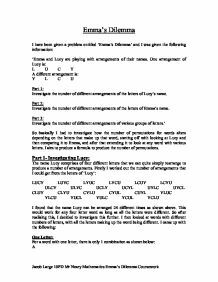 Investigate the number of different arrangements of the letters of Lucy’s name. 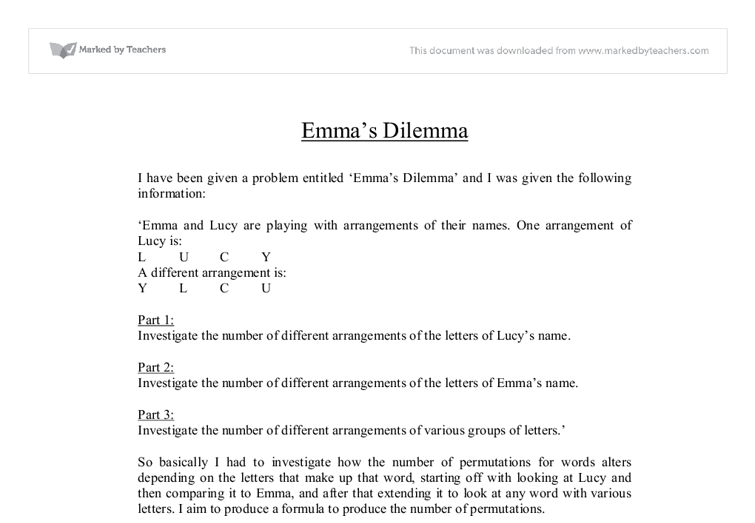 Investigate the number of different arrangements of the letters of Emma’s name. So basically I had to investigate how the number of permutations for words alters depending on the letters that make up that word, starting off with looking at Lucy and then comparing it to Emma, and after that extending it to look at any word with various letters. I aim to produce a formula to produce the number of permutations. After looking at this table, I could see that there was a pattern. The arrangements of words with different letters had exactly double the arrangements of words with one repeated letter, both words having the same amount of letters. So when two words have the same amount of letters, one having totally different letters and one having one repeated letter, the one with the different letters will have twice the number of possible arrangements of the one with a repeated letter. So we can look in general at how having letters the same affects the number of arrangements. So far we have looked at ABCD and ABBC. When all the letters are different, the amount of permutations is not restricted and you are free to move the letters into any position. When two of the letters are the same, the number of restrictions is reduced by half. When listing the arrangements you, you can’t complete half of the ones you would do if the two letters were different as the letters have already been in that position, even if it may have been the first B in the word for example and not the second B, the arrangement can’t be completed as the two Bs are not distinguished between. So we can now look at this data in relation to the formula I produced earlier for words with two repeated letters. The formula stated that the number of combinations (y) would be equal to letters in the word (x) factorial, divided by two (y=x!/2). So if we look at the equation and if it would be correct in a word where there are three of the same letters. The formula for words with two letters the same quite clearly doesn’t work for words with three letters the same. This seemed interesting as the formula obviously changed according to the number of repeated letters. I now wanted to find out how the formula changed according to number of the same letters. Y = 5! / 2! x 2! x 1! This proves that the formula that I came up with is correct for working out the number of different arrangements for any word no matter what letters it contains. Y = X! / A! x B! _ x _ C! Etc. Y is the number different permutations. X is the number of letters in the word. A is the number of repetitions of any letter. B is the number of repetitions of any second letter. C, D, E etc. is the number of repetitions of the remaining letters. Y = 9! / 4! x 3! x 2! There are 1260 different permutations for the word AAAABBBCC. Y = X! / A! x B! x C! x D! Y = 16! / 3! x 4! x 5! x 4! 3 times + 1 different letter: A/A/A/B AAAB AABA ABAA BAAA 4 combinations I used the same systematic method as I did for all the other cases as I did for this, but when I had finished it, I saw something quite interesting. This idea is represented by a exclamation mark called a factorial. The equation which represents this idea is: n! = a Where n = the number of letters in the word a = the number of different arrangements. This equation works for the name LUCY and all the names in the table. Judging from the content of all non-fictional and fictional letters, the fictional are more powerful in drawing the reader's attention and empathy. The letters written by 'Leighton' were all informative but there is a lack of attention on how he was feeling. 120 divided by 5 (number of letters) equals 24. Previously in the 4-letter word, 24 divided by 4 equals 6, the number of possibilities there were for each letter. 2 factors = 2 arrangements = 1 x 2 = 2! 3 factors = 6 arrangements = 1 x 2 x 3 = 3! 4 factors = 24 arrangements = 1 x 2 x 3 x 4 = 4! Therefore, the number of possible arrangements is equal to the factorial of the number of factors. TIM TMI MIT MTI IMT ITM Other lengths of words would therefore be: 2 letters = 2! = 2 x 1 = 2 5 letters = 5! = 5 x 4 x 3 x 2 x 1 = 120 6 letters = 6! For example, a 3 lettered word or a 2 lettered word. I will then hope to find some sort of pattern, which will then help me determine the outcome of a word with 10 different letters, without listing all the possibilities.